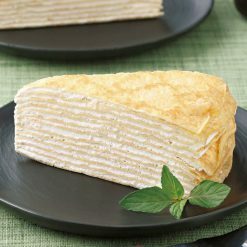 A mille crêpe made of 13 layers of crepes and cream, stacked alternately. Wow! Featuring the unique flavor and the subtle sweetness of Wasanbon sugar. Product totals 60 g (2 pieces). Mille crêpes are French cakes, made of many crêpe layers. The word mille in French means “a thousand”, pointing to the many layers of crêpe in a mille crêpe. 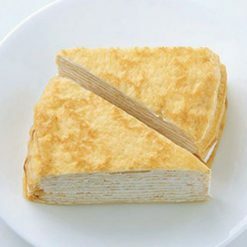 This Wasanbon mille crêpe was made by piling up crepes and cream, using Wasanbon sugar. For your convenience, the pieces are individually cut into each serving. Just thaw and enjoy! Wasanbon is the name of a Japanese fine grained sugar, made from Chinese sugarcane and traditionally coming from the Shikoku prefectures, Kagawa and Tokushima, of Japan. Shikoku is one of the four main islands in the south of Japan. Wasanbon sugar has a rich history dating back over 200 years. To this day, Wasanbon sugars are refined by humans, instead of modern sugar refining techniques, and kneaded by hand. This allows for the impurities in the sugar to be eliminated, so that the sugar is very smooth and easy to craft. Thaw in the refrigerator for about 4 hours before serving.Suggestion: you may also add fruits to the side. This product contains [Batter] eggs, flour, Wasanbon sugar (Tokushima Prefecture), margarine, whipped cream (food mainly made with raw milk, etc. ), reduced starch syrup, tapioca starch [Cream] fresh cream (35% milk fat), milk, food mainly made with raw milk, Wasanbon sugar (Tokushima Prefecture), gelatin mix powder (dextrin, gelatin, glucose). This product is not suitable for anyone with allergies to egg, milk, wheat or gelatin.